A spectacular quilt (80" x 95") that bears a remarkable resemblance to the Cathedral Window pattern. Pieced by a member of the Vanderbilt family in 1835, it is instead, constructed entirely with melon and star-shaped pieces that intermingle with each other to create the window illusion. Since each " star" is only about five inches, your collection of scraps can be useful! 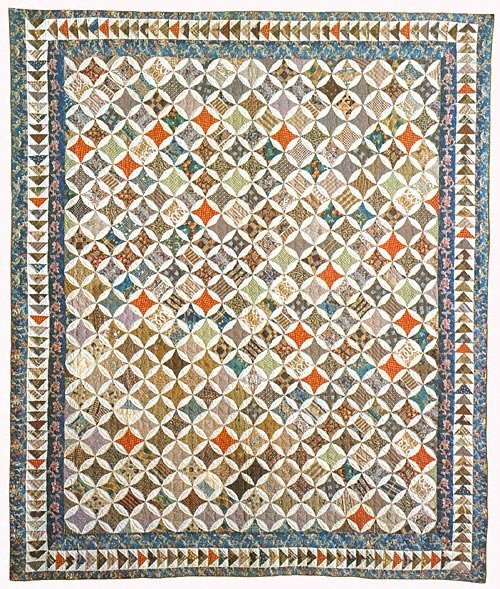 Make this bed quilt size or a smaller version wallhanging. Truly a conversation piece! Although all the shapes are printed in the pattern, it is made easier with the use of the acrylic templates offered. The shapes include the seam allowances, with the sewing line also given for the hand piecer. Truly something for everyone! The quilting stencils are also included. This quilt allows plenty of room for some beautiful quilting. Acrylic templates for the Pincushion Quilt are also available!